Both type­writer and strong encryp­tion is going to slow down com­mu­nic­a­tion, but uphold­ing a basic demo­crat­ic right of pri­vacy seems to be more import­ant, former MI5 agent Annie Machon told RT. 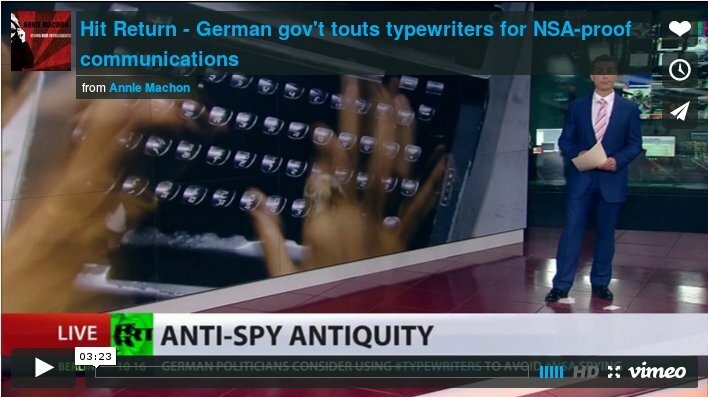 Amid the Amer­ic­an-Ger­man espi­on­age scan­dal, Ger­man politi­cians are con­sid­er­ing going back to old-fash­ioned manu­al type­writers for con­fid­en­tial doc­u­ments in order to pro­tect nation­al secrets from Amer­ic­an NSA sur­veil­lance. RT: Why would Ger­many think of using type­writers as a secur­ity meas­ure? Annie Machon: What I find inter­est­ing is that we have a situ­ation where even our demo­crat­ic­ally elec­ted rep­res­ent­at­ives have to think deeply and ser­i­ously about how to pro­tect the pri­vacy of their com­mu­nic­a­tions, par­tic­u­larly when the invest­ig­a­tion of the very sub­ject of inva­sion of the pri­vacy of the cit­izens, which is what the Bundestag at the moment is doing in Ger­many, try­ing to hold hear­ings to work out what exactly the NSA has been doing, which might be con­tra­ven­ing the con­sti­tu­tion of Ger­many. It is very dif­fi­cult now but it is still pos­sible to pro­tect your elec­tron­ic com­mu­nic­a­tions, but I think this announce­ment, this sort of state­ment by the Bundestag rep­res­ent­at­ive about going back to type­writers is inter­est­ing. It just makes a very strong point that we all need to be aware of the fact that we can be spied on at any time. RT: Do you think every­one would fol­low Germany’s example? AM: I think more and more people are con­cerned about their pri­vacy because of the Edward Snowden dis­clos­ures. He has done the world a huge ser­vice with great per­son­al cost, expos­ing the pred­a­tions of the US Intel­li­gence agen­cies and the NSA par­tic­u­larly, as well as a num­ber of European agen­cies. In the past all coun­tries spied on each oth­er because they wanted to gain advant­age over oth­er coun­tries, not neces­sar­ily their enemies, just an advant­age eco­nom­ic­ally or polit­ic­ally. How­ever, what we are see­ing at the moment is the res­ult of what was the per­fect storm for the USA in the 1990s, it was a per­fect oppor­tun­ity for them, because at that point the Cold War had ended, they were the sole remain­ing super­power on the plan­et, and pre­cisely at that moment we had the evol­u­tion of the inter­net, a huge tech explo­sion of com­mu­nic­a­tions. They saw the oppor­tun­ity and they went for it. Of course they did because that meant that they could embed whatever they wanted into the infra­struc­ture that the whole world now uses for com­mu­nic­a­tion. Of course they were not going to turn this oppor­tun­ity down, and they haven’t. That is what Edward Snowden dis­closed. So we have the situ­ation now when everything can con­ceiv­ably be hoovered up by the NSA and its vas­sal states in Europe, everything can con­ceiv­ably be stored for ever and be used against cit­izens in the future if the laws change. And everything can con­ceiv­ably be known amongst the private delib­er­a­tions of our parliament’s demo­crat­ic­ally elec­ted rep­res­ent­at­ives. It’s worse than Orwellian. It would be naïve to think that the US would not take up this oppor­tun­ity, but of course they did, and these are the res­ults we are liv­ing in. It would be lovely to think that we could go back to the era of hav­ing pri­vacy in our lives that our gov­ern­ments would have power to ensure we had it, but in this glob­al­ized world it is very dif­fi­cult to ensure that. One of the things that is little known out of all Snowden’s dis­clos­ures is the fact that it is not just what we send over the inter­net, it is also hard­ware, the com­puters, the tech­no­logy we actu­ally use that can already be com­prom­ised by the NSA. This is one of the things that came out just after Christ­mas last year. So we are liv­ing in a very com­plex world but there are very simple steps we can take, both the gov­ern­ments and the cit­izens, to pro­tect our demo­crat­ic and our basic right to pri­vacy. RT:Wouldn’t using type­writers slow things down in terms of com­mu­nic­a­tion? Why not use oth­er, more mod­ern ways of pro­tect­ing com­mu­nic­a­tion? AM: Either going back to using pen paper or type­writer or using very strong encryp­tion is going to slow down one’s com­mu­nic­a­tion, there is no doubt about it. The point is though, what is more import­ant, is it access to the latest celebrity gos­sip on the inter­net or is it actu­ally uphold­ing a basic demo­crat­ic right of pri­vacy. Because if we don’t have pri­vacy, then we lose our free­dom to com­mu­nic­ate eas­ily and in private, we lose our free­dom to ingest inform­a­tion via video, audio or from read­ing, we can­not plan, we can­not con­duct private per­son­al rela­tion­ships over the inter­net. So what is the price of a little bit of incon­veni­ence when it comes to pro­tect­ing our basic rights? I think that how­ever light-heartedly the Ger­man politi­cian men­tioned using type­writers, when it comes to prop­er secur­ity issues with­in gov­ern­ment, he is prob­ably abso­lutely right. Last year there was a report as well, say­ing that some of the Rus­si­an secur­ity oper­at­ors were now using type­writers too. We will all have to think about that, and it’s just a jolt­ing wake up call to make us all think about that by stat­ing that the Ger­man gov­ern­ment is now going back to type­writers for cer­tain things. RT: What kind of solu­tion do you see? Should people rely on their gov­ern­ments for pro­tec­tion of their pri­vacy? AM: There is a danger that people and the gov­ern­ment will become very para­noid about try­ing to pro­tect against the pred­a­tions of the NSA and its vas­sals in Europe. How­ever, I’m not sure as we as cit­izens can rely on gov­ern­ments to pro­tect our pri­vacy because all gov­ern­ments would want to know what is going on on the inter­net for legit­im­ate reas­ons as well, to try to track down the ille­git­im­ate crim­in­als and ter­ror­ists. But it can be easy for them to hoover up all the per­son­al inform­a­tion and we, as cit­izens, need that have that guar­an­tee of pri­vacy. So one of the things we can do as cit­izens is to take respons­ib­il­ity in our own hands. We can indeed source all tech­no­lo­gies, source com­puters pre-2008 that have not built-in hard­ware back­doors. We can use decent PGP encryp­tion, we can use Tor to hide what we are look­ing at in the inter­net, we can use oth­er encryp­tion meth­od­o­lo­gies to pro­tect our pri­vacy, and we need to. I think it’s a very inter­est­ing cross­roads in our his­tory, both as civil­iz­a­tions, as demo­cracy and as indi­vidu­als, but also how we view the tech­no­logy, how we use it, how we can bet­ter use it to pro­tect our life, so that is going it be an ongo­ing debate. I’m very pleased to see this in Ger­many par­tic­u­larly. The politi­cians seem to be wak­ing up around these issues and want­ing debate these issues because the USA has got away with it for long enough across the West.